Do you need garage door repair or replacement in Mesa or Flagstaff AZ? If your garage door is not working properly, you have a serious problem that needs to be addressed right away. If your garage door is stuck open, it is a safety and security issue. Unwanted intruders have easier access to your home, and any people or property standing under a stuck-open garage door may become injured or damaged if the door suddenly comes down without warning. If your garage door is stuck closed, it prevents access to the garage, meaning you must leave your car out on the street where it is exposed to the elements. It can also be more difficult to get what you need out of the space. In many cases, a broken garage door can be repaired at a reasonable cost. In some situations, though, you may need to have your door replaced. Deciding when garage door replacement is needed can depend on several different factors ranging from broken garage door springs to cracks in one section or multiple sections of your garage door that are no longer manufactured to list a few. For any and all garage door services in Mesa or Flagstaff AZ, contact Stapely Action Garage Door. We are the experts when it comes to garage door repair and replacement in Mesa, AZ. When Stapley Action Garage Door comes out to evaluate the condition of your garage door for replacement or repair, we will help you determine the best course of action, letting you know whether your door is a better candidate for repair or replacement, and providing you with an estimate of how much each option will cost. We won’t take any action until we’re sure you understand all your options and are satisfied we have settled on the best choice for you. Keep in mind that even if your door is not broken, you may want to consider replacement. Stapley Action Garage Door offers top of the line garage door replacement in Mesa AZ. So, if your door is old, out of style or doesn’t fit in with the design of the rest of your house, we can help — with some of the most attractive and popular garage doors on the market today. Garage Door Replacement Options In Mesa & Flagstaff, AZ. Stapley Action Garage Door can replace your garage door quickly and efficiently, with a wide range of beautiful garage doors to choose from. 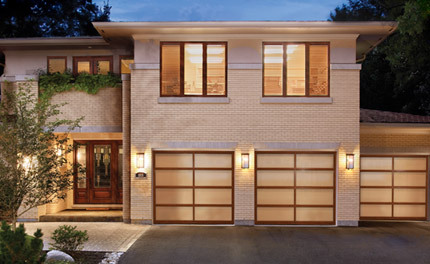 We recommend Americas #1 garage door manufacture Clopay garage door. Clopay doors are the market leader in attractiveness and quality, and these efficient, quiet doors are extremely popular among consumers in the Mesa and Flagstaff Arizona area and beyond. There are many things to take into consideration when choosing what model of garage door best fits your needs ranging from durability, noise, curb appeal, and cost, and we offer a variety of garage doors to fulfill a wide range of client requirements. But don’t just take our word for it. Take a look at the garage doors we have to offer today, then contact us for an estimate or to schedule an installation. Stapley Action Garage Door has been satisfying customers with garage door repair and replacement in Mesa AZ and the surrounding areas for thirty years. We offer top-notch, friendly, prompt service with technicians who always put the customer first and who won’t quit until they know you are fully satisfied with the results. Let us install a great new garage door for you that will transform the look of your whole home and will delight you and your family for years to come. For more information on garage door repair prices or custom quote contact us today or call us at 480-655-1255 to speak with one of our representatives.